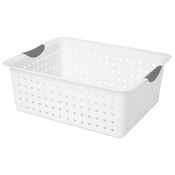 Sterilite baskets are a handy organizer to have on hand as they are very versatile. Use Sterilite baskets to organize any room in your house, office or daycare. Store craft supplies neatly on a shelf or organize kitchen supplies in a cabinet. A Sterilite stacking basket is ideal for organizing items in a small space, like the Sterilite stack & carry baskets. We also carry standard Sterilite storage baskets and Sterilite laundry baskets for all of your organizing needs. Shop all Sterilite baskets right here and get free shipping on any order shipping within the U.S...every day! 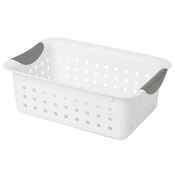 We carry several styles of Sterilite baskets so you can organize any room or any item. Shop for a Sterilite laundry basket, Sterilite stacking basket in 3 sizes or plain ol' Sterilite storage baskets.